This is just a simple pie, but there are a lot of memories attached to it. When my twin sister and I were little, we would spend every summer vacation at our grandparents’ house, away from the city noise. The house had a wonderful garden with lots of fruit trees: apples, cherries, and many kinds of grapes. In fact, we had more varieties of grapes in our garden alone than what is usually offered in a typical grocery store. But more relevant to my story, we had 3 gorgeous sour cherry trees that gave a generous harvest every year. We would always spend a couple of weeks pitting huge amounts of cherries (unbelievable how much fruit 3 trees would produce), and then our parents would make many cans of homemade cherry jelly and tart cherry preserves. Our mom would also make this simple pie with fresh tart cherries, using sour cream in a pie dough. It was so good! My sister and I loved to eat this pie for breakfast, with hot tea, while sitting outside under the grapevines. Their lush leaves provided such ample shade, that if you walked barefoot in the morning, the ground would feel pretty cold even on a hot summer day. We would sit at the old wooden table, on wooden chairs, eating deliciously juicy cherry pie to the singing of the birds! So many times, I go back to that memory, especially if I had a bad day or need some cheering up. Those were good times. I had a really happy childhood, thanks to my parents and my best companion, my twin sister. So this is the pie from my happy times. I got the recipe from my mom, and the only thing is that I can never find FRESH sour (or tart) cherries. Using sweet cherries is not the same, so I made this pie with canned tart cherries, and the pie came out almost as good as if I used fresh ones. But, of course, fresh tart cherries are so much juicer, much more tart and the color is much redder. I think I need to grow my own sour cherry tree, but it could be a difficult project here in Arizona. 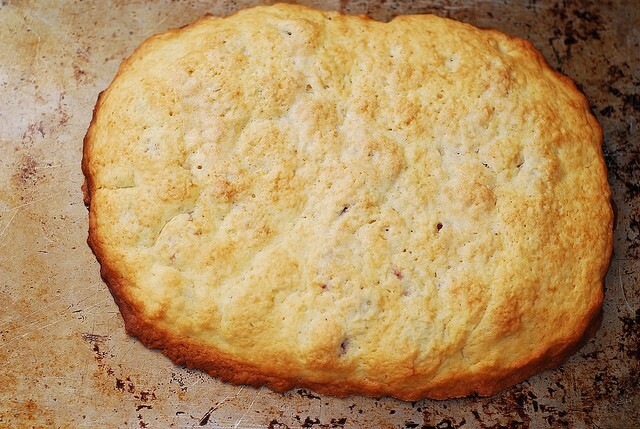 This is a “closed” type of pie, and I think there is a special “fancy” name for it, but I can’t remember what it is. Sometimes I make a smaller version of this pie (will fit on half the cookie sheet), sometimes I make the larger version of it (will fit the whole cookie sheet). So below I will list ingredients for both small and large versions of this pie (the measurements are simply doubled). The pictures here feature the smaller version of the pie. 1) Preheat oven to 350 F. Melt butter until it’s liquid. Add egg, sour cream to butter and mix until well incorporated. 2) In a separate bowl, mix flour, sugar, baking powder. 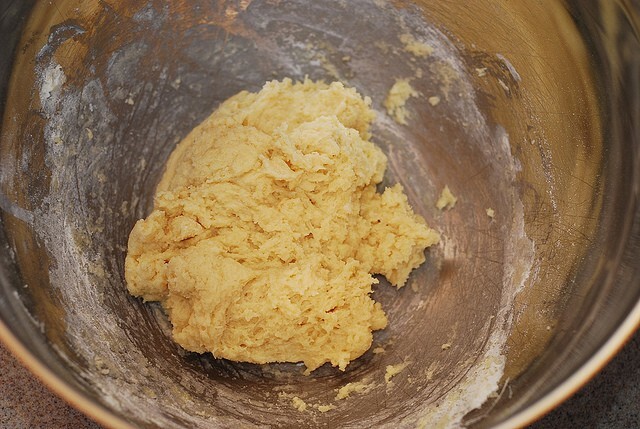 3) Add flour and sugar mixture to butter mixture and mix until well incorporated. The batter will be very soft – that’s normal. 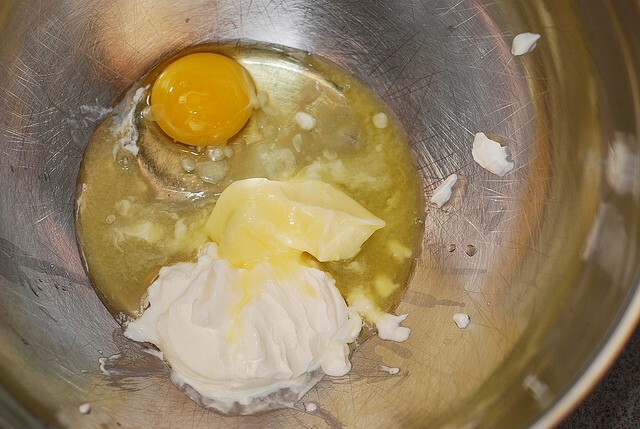 4) Divide batter in 2 equal parts. Grease 2 separate sheets of aluminum foil. 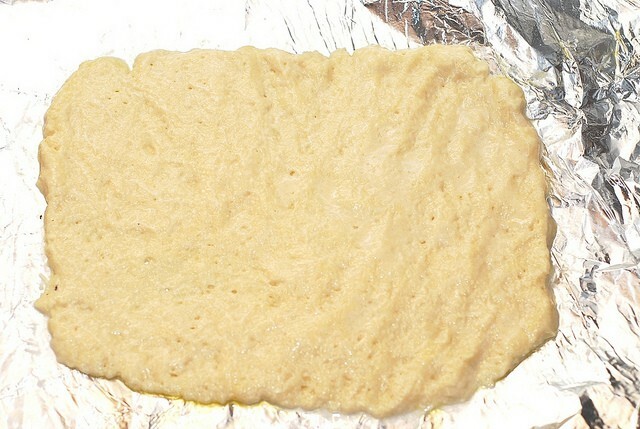 Using your hands, roll each portion of batter into a flat rectangular shape on a greased sheet of aluminum foil. 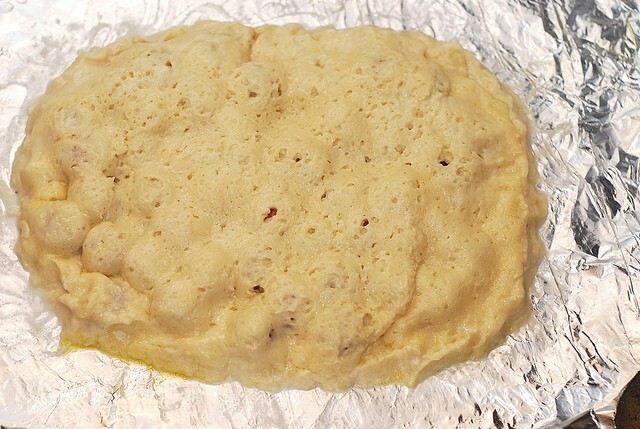 I don’t use flour to dust the top surface of foil, nor do I use flour on my hands. Instead, I run my hands in cold water and then use wet hands to press the batter into desired shape. If the batter starts to stick, I rinse hands with cold water again and then use wet hands to continue shaping the batter. 5) Separate canned sour cherries from the juice in the can. 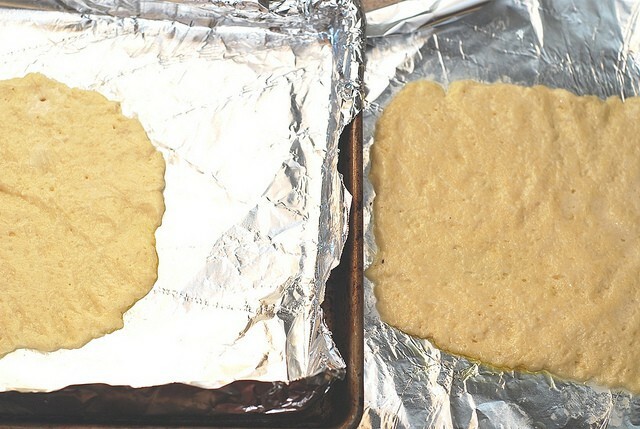 6) Place one aluminum sheet with rectangular shaped batter onto the cookie sheet. Top with cherries. Sprinkle the top of cherries with sugar (1/4 cup sugar for smaller pie, 1/2 cup of sugar for larger pie). 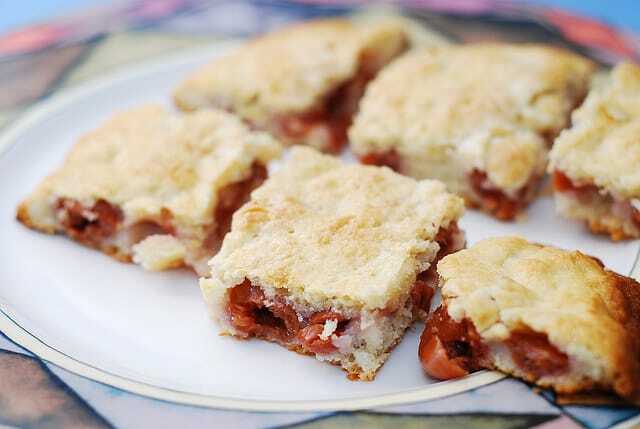 7) Take second sheet with batter and place it on top of the cherries. 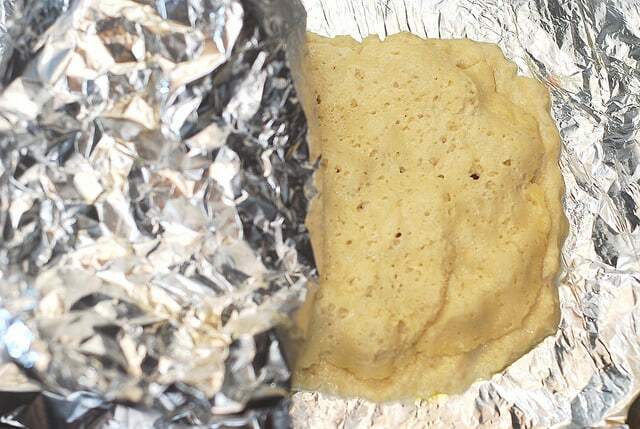 Carefully separate the foil from the batter. 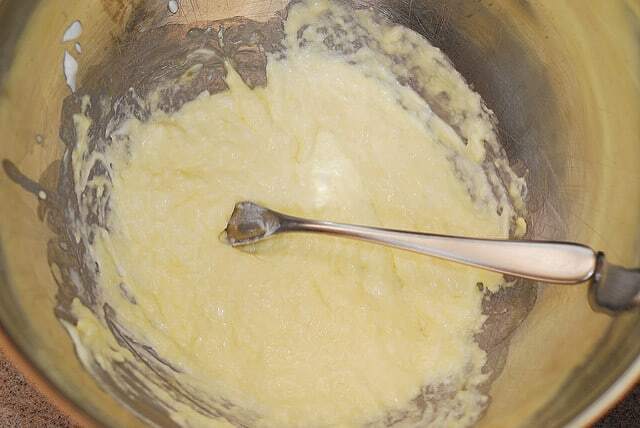 Close the gaps between 2 sheets of batter along the edges of the pie by pressing with your fingers. 8) Bake for about 30 minutes or longer until the top of the pie is golden-brown. I just finished making this and will definitely make it again. 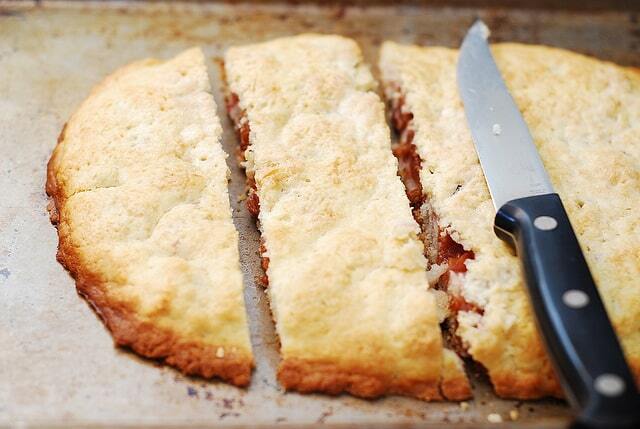 Although handling the dough was a bit tricky, the end result is delicious. I just but on some tart cherries out of a jar and they worked just fine. 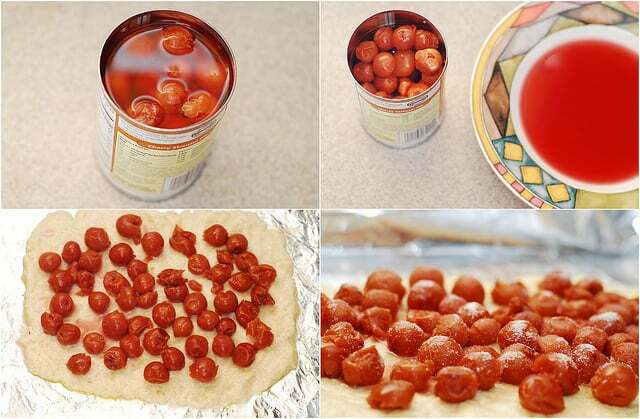 You will see that any thing could be substituted and even put on top after it comes out of the oven. It is very hard, if not impossible to eat only one piece. Thank You for sharing the recipe. Paul, you are very welcome! I am so glad you enjoyed this recipe! This is an old recipe of mine and I am glad you found it, made it, and liked it. 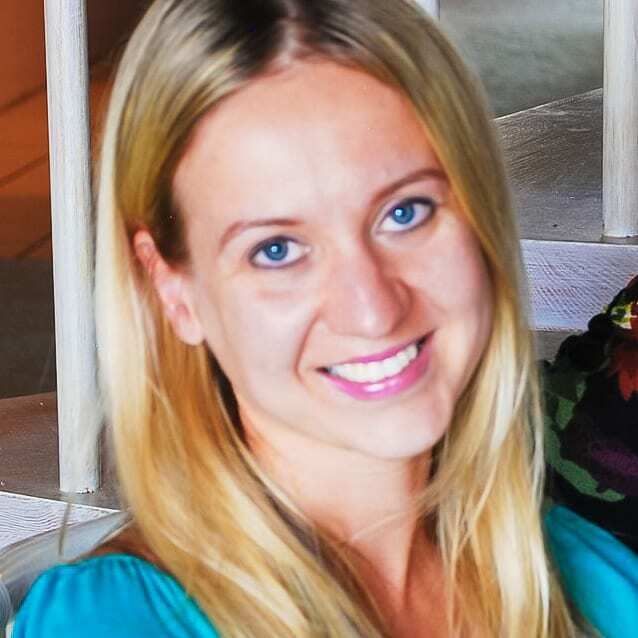 Hi Julia,, I have tart cherries in a large jar, not a can. How many ounces of cherries were in your can of cherries so I can adjust my recipe? If you don’t know the ounces, how many cups of cherries did you use? It doesn’t have to be precise. I bake often and can wing it a little. Thanks. I used 15 oz can of tart cherries. Happy baking! 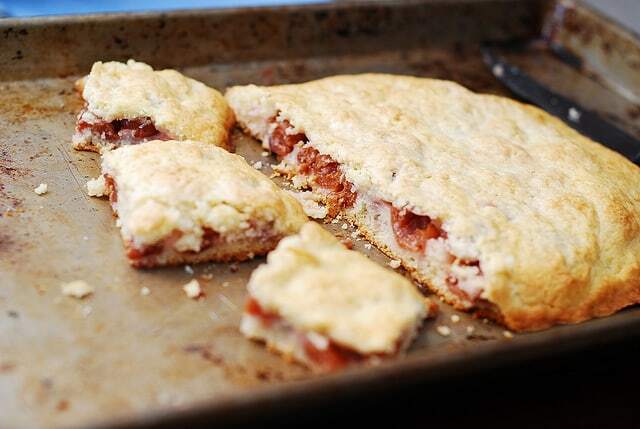 I just made this and it was very easy to make and it tasted great! I will definitely make it again. I made it using fresh sour cherries. Just the right amount of sweet to sour. 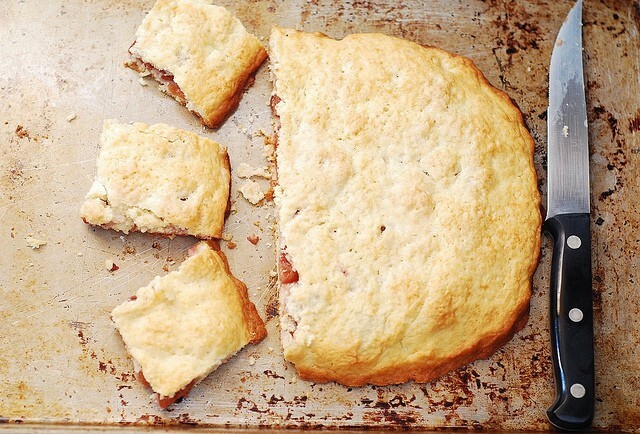 Although we’ve yet to read the recipe, obviously this is a hearty pie with sweet memories. Such lovely, enticing photos! I love foods that are inspired by wonderful memories! Memories can make dishes so special, love the little story behind these lovely pies!